Hiding is Roo Fanshaw’s special skill. Living in a frighteningly unstable family, she often needs to disappear at a moment’s notice. When her parents are murdered, it’s her special hiding place under the trailer that saves her life. As it turns out, Roo, much to her surprise, has a wealthy if eccentric uncle, who has agreed to take her into his home on Cough Rock Island. Once a tuberculosis sanitarium for children of the rich, the strange house is teeming with ghost stories and secrets. Roo doesn’t believe in ghosts or fairy stories, but what are those eerie noises she keeps hearing? And who is that strange wild boy who lives on the river? People are lying to her, and Roo becomes determined to find the truth. Despite the best efforts of her uncle’s assistants, Roo discovers the house’s hidden room–a garden with a tragic secret. Why did we read this book: We love Middle Grade fiction and this one looked really good. Ana: Sometimes my book-reading decisions are very easy to make: I wanted to read The Humming Room on the strengths of its cover alone. I knew nothing of it when I started reading it and didn’t realise it was a retelling of The Secret Garden (haven’t read that book) until I was done and read the blurb. I read the book without any expectations whatsoever and even though I have a few reservations, I really enjoyed this story. Thea: I, too, was immediately struck by the lovely cover for The Humming Room, but also was motivated to read the book because of the praise I’ve heard for Ellen Potter’s previous novel, The Kneebone Boy (which, incidentally, also has a gorgeous cover). I was thrilled to discover that the book was actually a retelling of The Secret Garden (which I haven’t read since I was a child), and found myself caught up in Ms. Potter’s lush writing style and enamored with heroine, Roo. I truly enjoyed this book, although it felt a little abrupt and I can’t help but think there should have been more to the story – but overall found The Humming Room to be a sweet, lilting read. Ana: The first thing that needs to be said is: I haven’t read The Secret Garden so I can’t say first-hand how much of The Humming Room is a close homage/retelling and how it might deviate from the original (or not). I do believe that being unencumbered by expectations or by previous knowledge of this story proved to be a blessing in this case (I mention this because earlier this week I reviewed Gil Marsh which was also a retelling and which I approached with great expectations). With that caveat out of the way, The Humming Room was an enjoyable, if uneven, read. Its first half is definitely its strongest: it is beautifully written and we get a good sense of the main character and her developing arc (more on that later). This story has been transported to modern times but there is a certain timeless feel to it which comes from the setting – an old mansion on an isolated island. It is evocative of old-fashioned stories and I loved it because of that. I also appreciated the subtle narrative that hints at mysteries, ghost stories and even tales of fairies. However, the second half is distinctively different. In the first half things were developed slowly, by introducing the main character Roo and the mysteries surrounding the house, the island and its inhabitants with gentleness and care. But once a secondary character is introduced and the mysteries revealed, the story is rushed up, leading to an extremely abrupt and undeveloped climax that left several things unexplained and unresolved – at least for me. Despite this unevenness, I am still glad that I have read The Humming Room. Thea: It has been a very long time since I have read The Secret Garden (or since I have watched any of the many film adaptations – my favorite being the one with Maggie Smith), and my memory of the story is a little fuzzy – I remember the highlights (the broken family, the supposedly crippled son and standoffish father, and for some reason I remember that maid Martha had a cockney accent), but I went into The Humming Room with no real expectations or demands. Happily, I found myself easily slipping into this more modern re-imagining of The Secret Garden without any trouble. Instead of following a young girl whose parents died of a cholera outbreak in British colonized India, The Humming Room takes a young girl named Roo from her trailer park home after her drug dealing father dies to live on a strange isolated island called Cough Rock in her uncle’s mansion. The story runs fairly parallel to the original source material – the orphaned girl moves to a secluded home only to stumble on a family saga, and of course, a literal and metaphorical secret garden that will blossom once again with care and time. From a storytelling perspective, I love Ellen Potter’s sense of atmosphere and backdrop – one of my favorite parts of The Humming Room is the setting of Cough Rock, the history behind the name (the mansion used to be a Children’s Hospital for those suffering from Tuberculosis), and the gothic, ghostly touch to the story. I loved the feel of the island, the river that surrounds it, and the folklore of the Faigne and the Yellow Girl. That said, I do have to agree with Ana in that while the style and setting to The Humming Room is beautiful in the first portion of the novel, something is lost by the second half, and the ending to me felt rushed and incomplete. I also remain unconvinced of the “magical”/fantasy aspects of the novel…but perhaps that’s just my own personal taste. Ana: Roo is a wonderful strong-willed protagonist and I thought her story arc was beautifully done and it showed character growth. The transition from a malnourished, lonely, stand-offish child to a blossoming young girl was my favourite aspect of the novel. I loved the small details of how Roo interacted with others and with the world around her – her hiding places, her talking to animals and her connection with the natural world. Unfortunately, the secondary characters are not developed much beyond their initial introductions and this is especially true about the villains of the piece are so underdeveloped (they shows up, they do villainy things, they leave never to come back) as to be completely pointless. Thea: I *LOVED* Roo as our heroine – she’s quiet and thoughtful and, as one character describes her, she takes in everything the world has to offer and makes herself hard like a steel beam. She watches, she listens, and she learns; I had no problems believing in this twelve year old protagonist and her own unique way of seeing and reacting to people around her. I’m a little hesitant to name any other characters, because to do so might spoil folks that are unfamiliar with The Secret Garden, so I’ll try to be sufficiently vague here: The characters from The Secret Garden are all in The Humming Room, following the same types of arcs and characterizations as those upon whom they are based. Again, the only disappointing thing to me was how rushed the book felt by its climactic scenes, and how I could quite buy into the fantasy-ish elements of the story (in particular, one fantasy-ish character). Ana: Despite its unevenness, I truly enjoyed The Humming Room and it made me really want to read The Secret Garden and see how it compares. 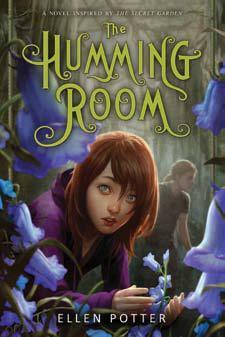 Thea: I agree that the book is uneven, yet I still thoroughly enjoyed reading The Humming Room. Ellen Potter’s beautiful sense of imagery, setting, and her loving care for description and language completely won me over. I’ll certainly be reading more from this author in the future. Agree about the Maggie Smith secret garden being the best–so what if she’s just playing the Dowager Countess?! 😉 (though i always do have a soft spot in my heart for the old BBC version–wore out the casette of that). Since I’m a big Hodgson Burnett fan, must pick this up. Great review, guys! I’m glad you both liked this one, even if there were some weaknesses. I thought it was a very well-done retelling, and that Roo was a fantastic and really identifiable protagonist. Ana, you should check out The Secret Garden! I mean to reread it myself. It was my favorite childhood classic, and I ought to revisit it (and YES, the Maggie Smith movie version is by far the best). I’d love to hear thoughts on The Kneebone Boy if you guys get to it before me. I saw the musical “The Secret Garden” with Mandy Patankin (I think I spelled that wrong). This book sounds lovely; I’ll have to check it out. I know it’s a small, insignificant detail as far as the whole review goes, but cockney comes from East London, right down in the south east of England, and Yorkshire is way up north. It’s like mixing up a Texan accent with a Brooklyn one. Yay thanks for the comments everyone! Phoebe – hah, I always think of Maggie Smith as being the dowager countess now, too! Naturally. Hope you like this one! Heidi – We both have KNEEBONE BOY on our lists. I’m really excited to check it out now, seeing how much I loved Ms. Potter’s writing in this book. Thanks for the rec! Katie – aww thanks, we always have a ton of fun writing these joint reviews too!!! Hope you like this one! Jackie – There’s a Secret Garden musical?!?! OMG. Must. See. Jess – ahhh, thanks for the clarification (and for coming out of lurkdom 😉 I was probably 12 when I read The Secret Garden, and definitely did not know/recall the differences between cockney vs Yorkshire accents. That’s a huge difference though! I’d imagine it would be more like a Brooklyn accent versus a Boston one, but I guess you learn something new each day! Maggie Smith is a total boss. I think I’ve seen that film version, but you know, lots of my childhood is kind of a blur. I’m glad that overall you both liked The Humming Room. And that it makes Ana want to read The Secret Garden. I definitely felt the same after reading, and think that’s a pretty good thing, when one book spurs curiosity for another book.